Straits cooking, be it Malay, Indonesian or Peranakan is characterised by the elaborated and generous use of chillies, spices and herbs. Given the variety that grows within the region, a slight difference in combination of these ingredients permutates to produce a plethora of different culinary delights which Straits cooking is so well-known for. 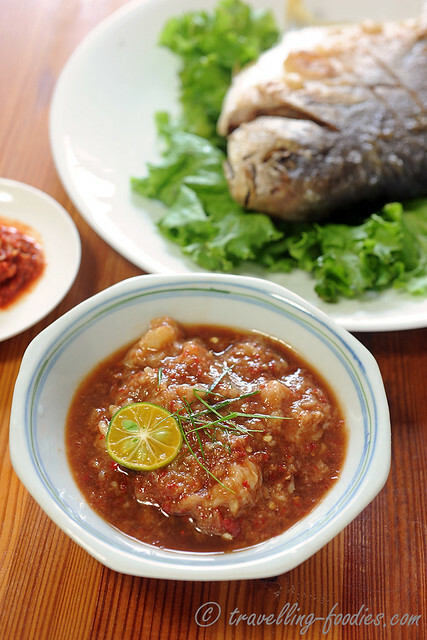 Baba-Nyonya cuisine, heavily influenced by the other cuisines in the region, pushes this further through the incorporation of fruits into dishes. 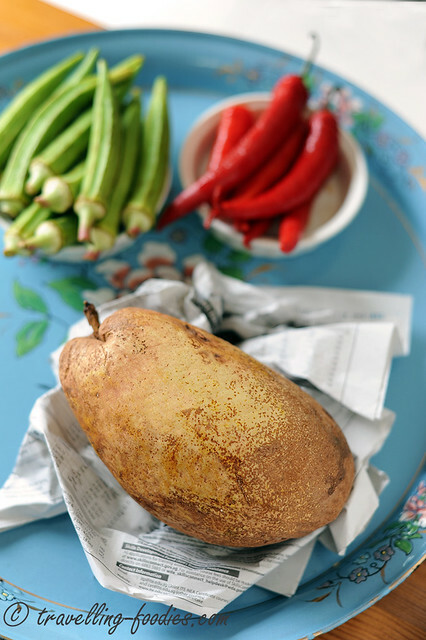 The additional dimensions rendered through these fruits often bring dishes from Peranakan cuisine to the next level, be it in visual appeal, aroma, texture and/or flavour. Mango, pineapple, jackfruit and bananas are the “regulars”, being used in many signature dishes which many of us are familiar with. Once a while, we encounter lesser known local fruit varieties like bilimbi buluh (Averrhoa bilimbi), buah cermai (Phyllanthus acidus), buah kedondong (Spondias dulcis) and buah sukun (Artocarpus altilis), buah binjai (Mangifera caesia). These would be a real treat to those who appreciate the interesting flavours which many of these fruits have. Of all these local fruits, one of the most elusive ones must surely be buah binjai. It is known to the Peranakans as “buah binjay” as one of the rules in the Baba patois changes borrowed words from Malay that end with “-ai” to “-ay” resulting in many morphological shifts like “serai-seray“, “pakai – pakay” and hence “binjai-binjay“. Not many Singaporeans know what buah binjai is anymore, let alone what it looks like. Or at least that is what my favorite vegetable and fruit sellers at the local wet markets I frequent patronise tell me and I am not surprised. This wild variety of mango is hardly seen in Singapore nowadays. But little known to most, they used to be widely grown around Singapore half a century or more ago. In fact, there used to be an old buah binjai plantation along Bukit Timah Road, which is incidentally one of the oldest roads in Singapore as well. Huge buah binjai trees used loomed the area, together with buah jambu air (jambu ayer) but of course given how rapid urban development is in Singapore, the buah binjai plantation is long gone, making way for equally large bungalows that stand now where these gigantic binjai trees once stood. 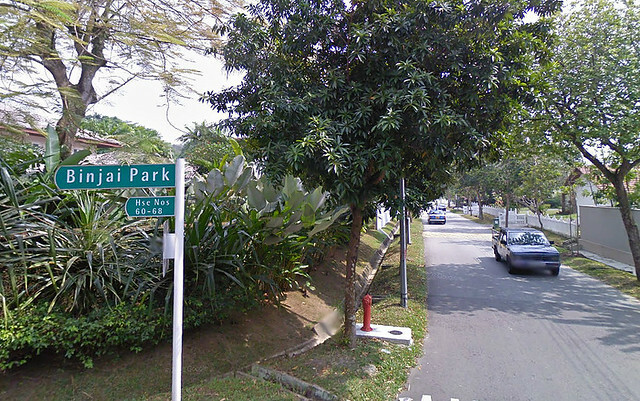 All that is left there now are road names like “Binjai Park”, “Binjai Rise” that commemorate their previous existence. Like many other mango varieties like Harum Manis, Alphonso and Chok Anan, buah binjai exudes a heady aroma which is yet un-mango like. To me, the aroma is rather complex, a melange of what one would expect by putting passion fruit, pineapple, mango and very very ripe pears together. It is not as pungent as durians but their presence could most definitely be felt. I know, because the Chinese auntie sitting beside me on the bus ride home from the local market where I bought the buah binjai asked what I have in the bag which is so “pang” (Hokkien to mean “fragrant”)! The flesh is very tart, not unlike passion fruit juice in some ways and thus the best way to enjoy buah binjai is to use them as a seasonal substitute for “asam” (sour) dishes which calls for tamarind (asam jawa), asam gelugor or belimbi buluh. I would imagine it to go very well in Ikan Gerang Asam or Sambal Udang Belimbing. 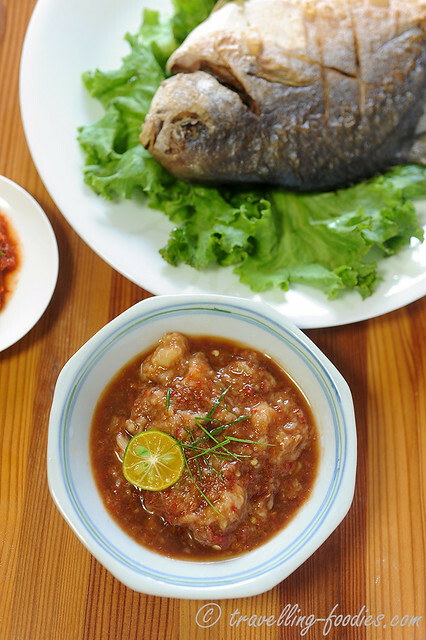 They can also be enjoyed raw by incorporating them into sambal belacan and eaten as a condiment with fried fish. That said, buah binjai can be of quite an acquired taste. It’s either you love it or you loathe it. For me, the combination is really out of this world! The heat and umami from sambal belacan is lovely balanced by the fruity tart flavours from the limau katsuri (calamansi limes) and buah binjai. It is so good that I could just eat it with rice! Try it if you have a chance to do so, and you’ll know what I mean! 1 ripe buah binjal (the flesh should feel very slightly soft when the skin is gently depress), about 400-500g. Cut all the chillies into smaller pieces. Seeds can be removed if less heat is preferred. 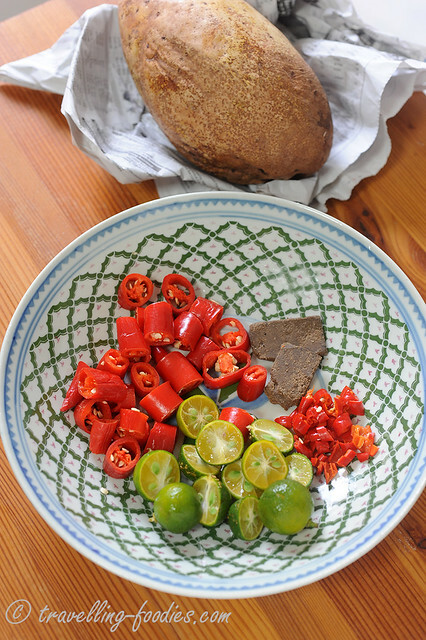 Pound all the sambal belacan ingredients excluding calamansi lime juice until a coarse paste is obtained. Add the juice of calamansi limes last, just to bind everything together. Using a fork gently mash the flesh very coarsely. Do not overdo this or the texture would be lost and too much juices would be released making the final concoction very watery. In a small serving bowl, add mashed buah binjai, a tbsp sambal belacan, sugar, soya sauce. Garnish with sliced calamansi lime and julienned daun limau purut. ** NOTE: buah binjal fruits are toxic when they are unripe. So one would rather err on the safe side to choose a fruit which is slightly ripen than to risk getting “sakit perut” from eating an unriped fruit. Cutting through the seed would release the milky sap within, which has also been said to be toxic. Or at least that was what I have been told. This entry was posted on August 30, 2013 by Alan (travellingfoodies). It was filed under Food, Simple Eats and was tagged with Baba, buah binjai, buah binjay, malaysia, Nonya, Nyonya, Peranakan, sambal belacan, Singapore, spicy, straits chinese, wild mango. I cannot believe you managed to find a buah binjai, let alone in Singapore. I haven’t seen it for the longest time. A sambal belacan with binjai is really out of this world, isn’t it? Where did u get the binjai? I’ve not seen it before. Been reading your blog for a while. Love what you are doing, recording for posterity the indigenous dishes of Malaysia/Singapore. That big shallow bowl in your second last pix with all the ingredients, reminded me of my late Portuguese Eurasian grandmother from Malacca. She used to hand-feed (suap) me and my brothers and cousins when we were little from a very similar looking dish, her lovely kristang curries and rice! Hi Alan – I’ve been searching around Singapore for the binjai fruit so far with little success. Went to Tekka and they thought I was after belinjau. Where did you buy yours? Hi. There are still 2 very large binjai trees growing in Binjai Park, at house #32 and #34. Unfortunately, they fruit only once every few years, in the months of May to July, and so you might have to wait a while for the next fruiting. But it is well worth the wait, because I can personally vouch that the fruit are excellent. During the binjai season in May to July each year, it may be possible to buy imported binjai in Geylang market. There is also a smaller fruiting season in January. But as one contributor mentioned, driving up to Johore, near Muar or Malacca, may give you a better chance of getting good fruit. Or if you leave me your name and contact, I will let you know when the fruit next arrive in Binjai Park! This makes me wanna go to the tamu right now to buy the fruit. Fortunately still available in Sabah. We call it buah belunu. I better plant one in my garden come to think of it.